Thank you for visiting The Orca Project’s “SeaWorld vs. OSHA” page. Here we will keep you updated on all the latest developments, testimony, links, documents, video, etc as this case moves forward. Also… be sure to follow us on FaceBook and Twitter (@TheOrcaProject) for all the latest news and reports. The U.S. Court of Appeals in Washington, DC has upheld the fines and citations issued by OSHA against SeaWorld and has shot down SeaWorld’s bid to overturn the lower court’s ruling that the fines and citations were justified. Click HERE to read the full 35 page decision by the U.S. Court of Appeals in PDF format. The fines issued by OSHA are negligible to the multi-billion dollar business SeaWorld Parks and Entertainment, but the restrictions placed on orca/trainer interactions will FOREVER change the look of killer whale shows. And WHEN the next tragedy occurs, SeaWorld will be sunk. Should SeaWorld choose to appeal this decision, their only (and final) avenue would be an appeal to The United States Supreme Court where SeaWorld’s attorney Eugene Scalia would likely argue the case before the 9 member panel, including his father, Supreme Court Justice Antonin Scalia. November 12, 2013: SeaWorld appealed to the U.S. Court of Appeals in Washington, DC today to overturn the lower courts ruling to uphold the fines and citations issued by OSHA: Oral arguments have concluded for both sides. The case is in the hands of the 3-Judge panel. Stay tuned for updates. SeaWorld is appealing the broad application of the federal OSHA safety law meant to protect workers in unusual circumstances which OSHA used in issuing its citations to SeaWorld. The case came before a three-judge panel of the U.S. Court of Appeals for the District of Columbia Circuit. The venue for the proceedings was at the Georgetown University Law Center, Washington, DC. Eugene Scalia, son of Supreme Court Justice Antonin Scalia, is representing SeaWorld in its fight against a federal order that sharply criticized the marine park operator’s safety measures. 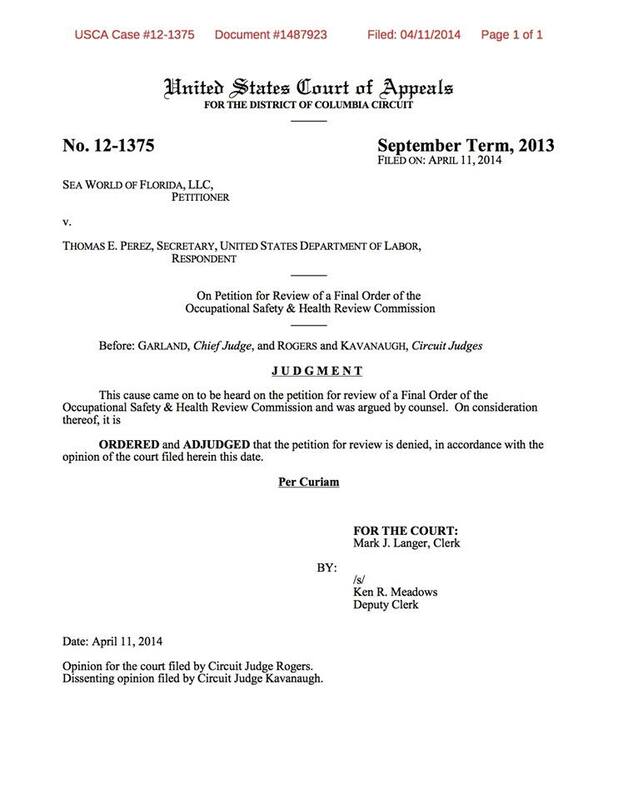 MAY 30, 2012: The SeaWorld vs OSHA verdict is in and Judge Ken Welsch has upheld OSHA’s citations in the SeaWorld vs OSHA case. In August, 2010, OSHA issued citations to SeaWorld for apparently placing profit above employee safety following the death of Mrs. Brancheau who was brutally killed by Tilikum, a nearly 12,000 pound (5,443 kg) killer whale (Orcinus-orca) on February 24, 2010. The citations, included fines totaling $75,000 for safety violations including the maximum $70,000 penalty for the “Willful” act of knowingly placing its employees at risk, a charge that has major implications beyond the monetary value, which is not substantial for the multi-billion dollar marine park. The stunning announcement rekindled the ongoing debate of keeping these intelligent, highly-social beings in captivity for entertainment purposes. It has also sparked a growing number of former SeaWorld employees to speak out about the culture of working with orcas and the secrecy that shrouds the marine mammal entertainment industry. SeaWorld continues to fight the OSHA citations. The first round of a hearing before an Adminstrative Law Judge wrapped up on September 23, 2011, reconvened on November 15, 2011 and conluded on November 18, 2011. The citations against SeaWorld were upheld by Administrative Law Judge Ken Welsch and now SeaWorld has appealed the case to the U.S. Appeals Court in Washington, DC. SeaWorld Killer Whale Trainer Attack Video Goes Viral – Watch the full 15 minute video from 2006 of Ken Peters being repeatedly dragged to the bottom of the pool by killer whale Kasatka. Administrative Law Judge Ken Welsch described the footage as “chilling”. SeaWorld Ponders Defeat in OSHA Ruling. Trainer Death May Alter Industry Forever – In May, 2012, Judge Ken Welsch upholds OSHA’s citations in the SeaWorld vs OSHA case. Seeing is Believing: Tilikum’s Lonely Life after Dawn– There has been deep concern for how Tilikum’s isolation may affect the well-being of this intelligent, social animal. After observing Tilly and his caretakers, is SeaWorld living up to its claims of a fulfilling, enriched life? SeaWorld Trainer Death Theory Debunked as a Ponytail Tale– Ever since the brutal death of Dawn Brancheau, the media has erroneously cited the marine park’s claim that killer whale Tilikum pulled her into the water by her ponytail. But why is this false theory important to SeaWorld? We present the facts of what really occurred and was observed by witnesses on that day. SeaWorld’s Proposed Multi-Million-Dollar Safety Gimmicks Don’t Measure Up– SeaWorld’s announcement that they are spending tens of millions of dollars on new safety devices, draws skepticism from former trainers, marine mammal professionals and journalists. Keto and Tilikum Express the Stress of Orca Captivity– Former SeaWorld trainers Dr. John Jett and Dr. Jeffrey Ventre provides detailed observations, powerful photos and strong statistical calculations, for a look behind the scenes of Marine Parks and their ability to provide environments adequate for keeping captive killer whales alive. Killer Whale Tilikum Returns to SeaWorld Shows After 3rd Death– a little more than a year after brutally killing veteran orca trainer Dawn Brancheau, Tilikum returnes to performances. The Case Against Killer Whale Captivity– in collaboration with The Orca Project, Dr. Naomi Rose, Senior Scientist at the Humane Society has released another groundbreaking paper “Killer Controversy: Why Orcas Should No Longer Be Kept in Captivity”. For a collection of documents from the investigation of SeaWorld trainer Dawn Brancheau’s death including autopsy report, Orange County Sheriff’s Office Investigative Report, USDA-APHIS and OSHA freedom of information act documents, click HERE. Click HERE to view The Orca Project’s collection of SeaWorld’s orca profiles. The Killer in the Pool– When a 12,000-pound orca named Tilikum dragged his SeaWorld trainer into the pool and drowned her, it was the third time the big killer whale had been involved in a death. Many observers wondered why the animal was still working. But some experts, knowing the psychological toll of a life spent in captivity, have posed a darker question: Was it human error, or can a killer whale choose to kill? 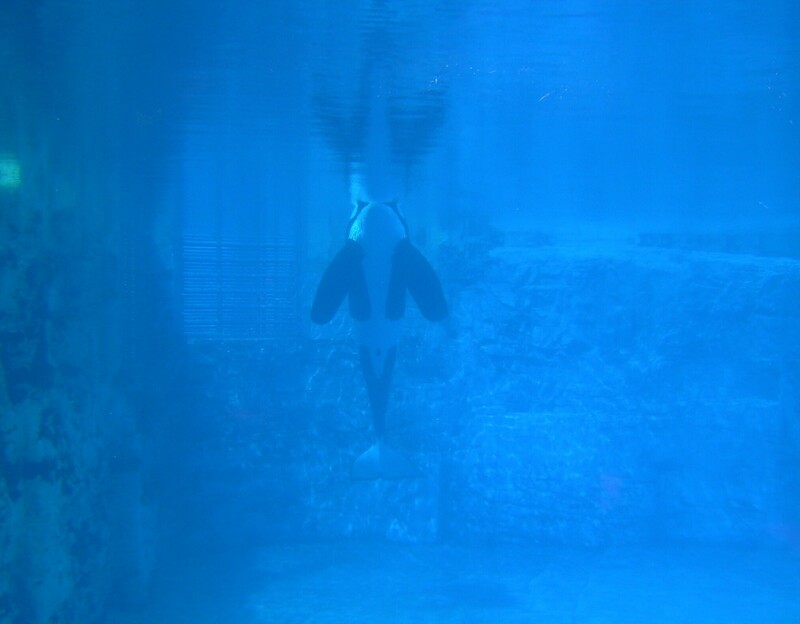 Diary of a Killer Whale– Tim Zimmermann digs a little deeper into some of the questions surrounding the tragedy of Tilikum and Dawn Brancheau. Blood in the Water– On December 24, 2009, a 6,600-pound SeaWorld orca killed trainer Alexis Martínez at a marine park in the Canary Islands. Two months later, trainer Dawn Brancheau was killed by an orca at SeaWorld Orlando. With the OSHA trial on trainer safety at SeaWorld Orlando starting September 19, Tim Zimmermann asks: Should Martínez’s death have served as a warning about the lethal potential of killer whales being trained for our entertainment? Safety of SeaWorld trainers questioned in OSHA hearing– Jason Garcia of The Orlando Sentinel reports in the Sentinel’s sister newspaper the Chicago Tribune that OSHA attorneys will question the “ponytail theory“. Hearing begins in death of killer whale trainer– CNN reports on the opening of the SeaWorld vs. OSHA hearing. Death at SeaWorld — Should Videotapes of the Killing be Released?- David Kirby, author of the soon-to-be released book “Death at SeaWorld – Shamu and the Dark Side of Killer Whales in Captivity” (St. Martin’s Press) discusses the upcoming battle to show the underwater video of Dawn’s horrific death in the Huffington Post. The question: Whose fault was the death of Dawn Brancheau– Michael Mountain of ZOE Nature reports on the testimony of day 1. Fredy Herrera, a security officer at SeaWorld Orlando who was working at Shamu Stadium on the day Brancheau was killed, testified that it appeared to him she was pulled in by her left arm, as we have reported HERE at The Orca Project. SeaWorld guard: Killer whale appeared to pull trainer underwater by her arm, not hair– Jason Garcia of The Orlando Sentinel reports on Day 2 of the SeaWorld vs OSHA hearing. Ponytail theory takes another dive– Michael Mountain of ZOE Nature reports on the testimony of day 2. The morning began with a report on NBC’s Today Show, continuing the coverage of yesterday’s testimony which essentially puts the “ponytail theory” to rest, including highlights with The Orca Project’s Colleen Gorman. Watch the Today Show video below or by clicking HERE. Not all whale aggression made it into SeaWorld’s incident log, lawyers say– Jason Garcia of the Orlando Sentinel reports on today’s testimony describing the ommissions in SeaWorld’s incident reports. SeaWorld Scrutinized Over Whale Incident Reports– A mid-day report from Orlando, Florida’s NBC affiliate WESH 2 looks at todays’s testimony on “incident reports”. Read their story and watch the video (including comments from The Orca Project) which shows that SeaWorld has side-stepped safety issues. … and video of the 2006 attack on trainer Kenneth Peters at SeaWorld SanDiego was played in the courtroom. Judge Ken Welsch called the video “Chilling”. Watch the full 15 minute video shown in court HERE. When orcas attack– Michael Mountain of ZOE Nature reports on the testimony of day 3. SeaWorld trainer Jan Topoleski took the stand today to describe what he witnessed. Topoleski was acting as the “safety spotter” for Dawn during her interaction with Tilikum during the “Dine with Shamu” show and he reports to have witnessed the initial take-down. His recollections today seem to differ than those originally reported to the Orange County Sheriff’s Office regarding the “ponytail theory“. His report on what occurred that day has been previously been called into question based on all other eyewitness reports of how Dawn was pulled into the water, including SeaWorld employees and park visitors. The Connell family, who captured the infamous final images of Dawn and Tilikum on video have also previously reported that Topoleski was not watching when Dawn was pulled in and they had to alert him that Dawn was taken down. You can read the Connell family’s reports to the Orange County Sheriff’s Office in our collection of documents HERE. Spotter saw SeaWorld trainer struggle to free her hair– Jason Garcia of the Orlando Sentinel reports on today’s events. Author David Kirby appeared again tonight on CNN’s AC360 with Anderson Cooper to discuss today’s testimony and Jan Topoleski’s apparent conflicting accounts of Dawn being taken into the water by her ponytail. Watch the CNN video below or click HERE. It’s still about the ponytail– Michael Mountain of ZOE Nature reports on the testimony of day 4. SeaWorld-OSHA hearing in recess until mid-November– Jason Garcia of the Orlando Sentinel reports on today’s events. Official says SeaWorld put whale trainers at risk– By Barbara Liston (Reuters) – A government safety official said on Friday that Florida’s SeaWorld knew it was putting trainers at risk by letting them interact with a 12,000-pound killer whale named Tilikum. “If you end up in the water with Tilikum, you’re going to die”- Michael Mountain of ZOE Nature reports on the testimony of day 5, including the “Tilly Talk” that’s given to all new orca trainers at SeaWorld Orlando. Is working closely with killer whales in a marine park dangerous for trainers? Author and journalist Tim Zimmermann delves into this question in his report “OSHA Goes After SeaWorld” in Outside Magazine Online. As SeaWorld safety hearing resumes, feds focus on killer-whale shows – Jason Garcia of the Orlando Sentinel looks at the upcoming strategy and the future of killer whale shows. “SeaWorld’s Training Methods; Why Trainer Injuries Are Inevitable”– Seattle PI reporter Candace Calloway Whiting explains why. Mr Peters testified that they can predict killer whale behavior 99.9% of the time. Michael Scarpuzzi, SeaWorld San Diego’s Vice President of Zoological Operations, was deemed a hostile witness by the judge for giving brief and evasive answers. “OSHA questions SeaWorld San Diego killer-whale trainer as safety hearing resumes”– Jason Garcia of the Orlando Sentinel reports on the resumption of the SeaWorld vs OSHA hearings. “OSHA hearing into killer whale trainer’s death resumes”– CNN covers the resumption of the hearings. “SeaWorld returns to court to defend killer whale shows”– Orlando News 13 reports on today’s events. Brancheau’s widower Scott, who has been in the courtroom for all the proceedings, was visibly upset at the notion. The Judge denied the motion, refusing to dismiss the case,and SeaWorld began presenting its side. “Judge won’t dismiss OSHA citation; SeaWorld mounts its defense of trainers’ ‘water work’ with killer whales”– Jason Garcia of the Orlando Sentinel reports on today’s heated testimony. “SeaWorld Trainer: Tilikum ‘easy-going, congenial”– Orlando News 13 reports as SeaWorld’s first witness is called to the stand. “How Did SeaWorld Florida Handle Waterwork After Alexis Martinez Died?”– Author and journalist Tim Zimmermann, who is reporting live from the hearings, questions the timeline described in court regarding the suspension of waterwork after Alexis Martinez died at Loro Parque, and the resumption of waterwork at SeaWorld Parks following that equally tragic event. SeaWorld’s knowledge of the precursors to another killer whale attack were called into question, including their handling of killer whale/trainer interactions following the death of trainer Alexis Martinez at Loro Parque 8 weeks prior to Dawn’s death. Because the Loro Parque incident was under-reported in the media, it appears that SeaWorld’s protocol had changed from what was typically followed after highly-publicized incidents that occurred here in the U.S., where trainers were routinely pulled from the water for long periods of time following an attack or injury. Although Alexis Martinez was killed by Keto, a SeaWorld owned orca who is on loan to the marine park in the French Canary Islands, trainers in Orlando were only pulled from the water for two days; a fraction of the time that trainers were not allowed to interact with killer whales following less injurious incidents when the media widely reported the event. The “Ponytail Theory” was also called into question as Kelly Flaherty Clark, curator of animal training at SeaWorld took the stand. Although the controversial theory that Dawn was pulled into the water by her ponytail has been been debunked, SeaWorld has tried to show they have mitigated the danger by requiring that trainers wear their hair in buns. “OSHA accuses SeaWorld of being influenced by media”– Orlando News 13 reports on today’s events. “Possible ponytail dangers on SeaWorld’s radar before drowning”– although some of the facts (and title) of this report are skewed and incorrect, Reuters reports on today’s testimony regarding the influence of ponytails on trainers. The Seaworld vs. OSHA case concluded today and is now in the hands of Judge Ken Welsch. It could take several months before he renders a decision. Today, Chris Dold, vice president of veterinary services for Orlando-based SeaWorld Parks & Entertainment Inc provided testimony including an admission that about 14 of 20 orcas at SeaWorld require antiseptic flushes of their drilled teeth after breaking them on the surfaces of the concrete pools and during interactions with other whales. “SeaWorld-OSHA hearing ends; decision months away”– Jason Garcia of the Orlando Sentinel reports on today’s testimony and the conclusion of the SeaWorld vs OSHA hearings. Is working closely with killer whales in a marine park dangerous for trainers? Author and journalist Tim Zimmermann recaps his observations from the courtroom in his report “OSHA Goes After SeaWorld, Part 2” in Outside Magazine Online. We urge former and present trainers, marine mammal park employees (in the U.S. and abroad), scientists, authors, individuals and the media to contact us at info@theorcaproject.com to continue this important work. Confidentiality is assured if you wish to remain anonymous. There are so many more developments occuring behind the scenes here at The Orca Project and we will keep you posted as information and events unravel. November should prove to be eye-opening and and a great step forward in ending the unecessary and unjust practice of orca captivity. Your sick if you think its okay to have killer whales captive in those tanks or whatever, or have any animal that belongs in the wild captive. NOT ONLY DO THE WHALES AND EVERY OTHER ANIMAL SUFFER, THE TRAINERS SUFFER TO. Half of the trainers are probably brainwashed to thinking that its okay to have whales captive, their brainwashed so if any body whos against sea world comes up to them and ask them about the whales to just smile and say everything is okay. Its makes me sick!!! Theres been sooooo many death of trainers due to the whales and sea world just hides that information and lie about there death. Imagine you were taken from your family and was locked in a room and just had to take orders for the rest of your life. Well thats basically whats happening to these animals. I just still cant believe sea world is still up and running. Sea world doesn’t even bother understanding why they should keep whales and the other animals captive, their just worried about making money and “entertaining” the people. Its soooo ridiculous it makes me sick. Sea world could careless if a few trainers get KILLED be a whale or if a few of there whales died because of stress and/or trauma. If people want to see whales, dolphins and all these other animals you could go see them in the wild (ocean) where they belong, THEY ARE NOT YOUR PETS!!!! I dont care what anyone says or disagrees with me. ive been in love with orca whales since free willy “keiko” and i was a big part of bringing him home, he should have NEVER went into captivity in the first place…im going to school for this reason…i love keiko and i want to be able to help orcas from sea world or any place back into the ocean where they belong, and also watch and protect them in the wild….i will do whatever i have to to make sure there out of captivity, help them in the wild and make sure they dont go into captivity. Call me crazy but these out breaks at sea world are because they been there for a long time knowning they rather be free and rome around with there families like what dont you get or understand about that??? its common sense, orca’s wouldnt want to be away from home let alone be in a take thats not deep or big enough, they want to be in the wild with others and do what they want and be with family….yall people are sicking with keeping them in captivity like seriouslyy?? its like taken a baby from its parents and never giving them back….come on i know some of you are smart others i dont know…im against sea world and ill do what i have to to help orca’s…i will fight till i diee to protect orca’s!!!!!!!! I want to help! I dont even know if thats possible. 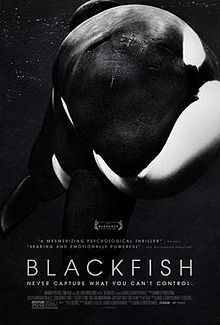 I watched the documentary Black Whale and I cried, I cried not only for the ones that have lost their lives but for the whales like Tilley. I have not been to Sea world since I was little but plan on NEVER goibg there again. Im devastated and just want to help. black fish^ , wwf has a program where you can “adopt” a orca , the price is like $55 and they send you a plush look alike , a certificate, and a photo. they use the money to help them. hope that helps. I believe in letting nature be. If human beings weren’t here on this earth the animals including the whales and dolphins would be left alone in their own habitat. Killer whales are you to being in water across the whole world . Not a little bitty pool that “supports” them. STOP THE ABUSE, it’s not meant to kill it’s human error. It’s as if you’re bothering a alligator, leave it alone and it won’t try to bother you. The same with any animal that feels bothered and agitated. Love the whales in their natural habitat. Don’t bring them to our world. Animals kept in captivity and used to hold shows for money..
What has happened to humanity? Why can’t a sane person stop, and think. What if it was you in there? What if you were captured and taken away from your family and used for somebody’s profit? you are 100% right, in the “the whale” which i recommend people watch although it is very sad. in the movie the DFO gets involved in a case concerning a baby killer whale who had gotten lost from its family. due to loneliness the whale communicated with humans. the DFO did not approve of this relationship and people were told they were even aloud looking at the whale or else they would be fined 100,000$ despite the poor animal begging for attention. but if people are not even aloud to look at a whale or interact with it how can they be captured????? how is this legal?????? I dont want to believe that whales shouldn’t be held captive, but as much as i dont i know its true. I’m currently a junior in high school and ever since I set hand on the Shamu glass eleven years ago I knew I wanted to pursue a career in marine biology and become a killer whale trainer at Sea World, & to this day theres still nothing more I want to do with my life. As a matter of fact im currently halfway through the book “Death at Sea World” that Kirby wrote, and yes reality hurts and he had many good points, but I believe becoming a trainer you have to know what your doing and be aware of what could happen. Many people ask me “What if you get eaten or killed?” my awnser is the same every single time. “At least I’ll die doing something I love”. I don’t care if it’s a low paying job, or the high risks Im taking. I know killer whales are very intelligent creatures, and they probably go crazy being held in such a small enviroment, but trainers don’t just neglect these whales and only use them for show buisness. With being a trainer comes great compassion, and taking great pride & advantage of taking care of these whales, and interacting and doing it not because you have to, but because theres nothing else you want to do. I do see where people are coming from when they are on the side that whales shouldn’t be held captive, but these animals are very well precious to Sea World and tooken care of. I love these creatures with all of my heart. Im going to career camp over the summer of 2013 to get my prior experience and nothings going to stop me. Oh Daniela, youth at it’s most selfish and naive. You people are just sick. These trainers don’t go out and train and work with these whales because it is the only job out there. They don’t say “Gosh there are no other jobs… Hey i could see if Seaworld will hire me.” No they take it into care that they prepare for this job. I even at a young age started thinking about my future career and going into science for this job. You are right Scarlet they don’t, they want to learn about whales. The problem is that captivity isn’t about conservation it’s about money. Trainers are blind sided in many situations by what the company they work for wants them to believe. They love these animals just as much as anyone else does. I’ve dreamed of swimming with whales and sharks since I was 5 and because I know the facts I will never do it in a captive situation. I believe that today there is a better option than going to a marine park. That’s my choice and everyone has their own opinion. People who support Sea-world clearly are just ignorant to the facts, either that or they’re complete heartless sociopaths.